Current: REED GUNTHER ROUND UP! Berkeley, CA â€“ 4 October 2011 â€“ The wild west adventures of Reed Gunther, Sterling, Starla, and all of Shane and Chris Houghton’s colorful characters will be gathered together into their first trade paperback from Image Comics this November with the arrival of Shane and Chris Houghton’s REED GUNTHER, VOL. 1 TP. This colorful collection of excitement, friendship, and adventure is guaranteed to be fun for folks of all ages! In REED GUNTHER, VOL. 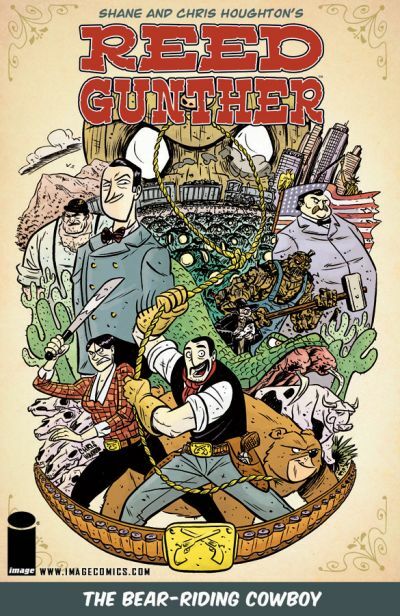 1 TP, our hero Reed Gunther and his trusty grizzly bear steed will bumble their way through the wild west, fighting giant snakes, hoards of mole creatures, a resurrected John Henry zombie, freak show freaks, special government agents, and all sorts of wild monsters created by an ancient mysterious idol! REED GUNTHER, VOL. 1 TP (SEP110428, ISBN: 978-1-60706-462-6), 184-page full-color all-ages western comedy adventure for $14.99, will come galloping full speed into a store near you on November 9. For more information on Reed Gunther, Sterling, and all their unruly friends and foes, visit www.reedgunther.com.